The tourist office of Antigua uses the tagline, ‘365 Beaches – 1 for each day of the year’. I haven’t counted but I take it with a pinch of salt, or a perhaps more appropriately with a pinch of sand. There are a wonderful variety of beaches however, from the windy Atlantic coast to the sheltered and idyllic Caribbean side. I wake up in a different mood every day, and I could say that there is a beach for each of my moods – surf chick, beach babe, playground Maman, snorkeler, sandcastle builder, wildlife spotter. Rendezvous beach fits very neatly into the Wave category and also the Unspoilt. As the beach access is only by 4 x4 or foot from the land side, it tends to be a very quiet spot. There was just one other couple there when I was there, until Antigua Adventure boat tours arrived. For about half an hour it was like the Normandy landings (although accompanied by the ubiquitous Rum Punch), and then it was back to peace again. Rendezvous beach is situated at the south of the island, not too far from English Harbour. To find it you should follow the signs for Springfield Riding Club, and then keep going. There is a big development ear-marked for the area but as yet it is just a fenced area called Papaya Drive. There are also signposts warning that the road is not maintained, which it clearly isn’t, but all the better for the purenenss of Rendezvous. Clearly it is a very bumpy drive, but the more adventure-oriented will enjoy the drive as much as the beach. If you don’t have your own car, there are 4×4 adventure companies that head out this way in little buggies. 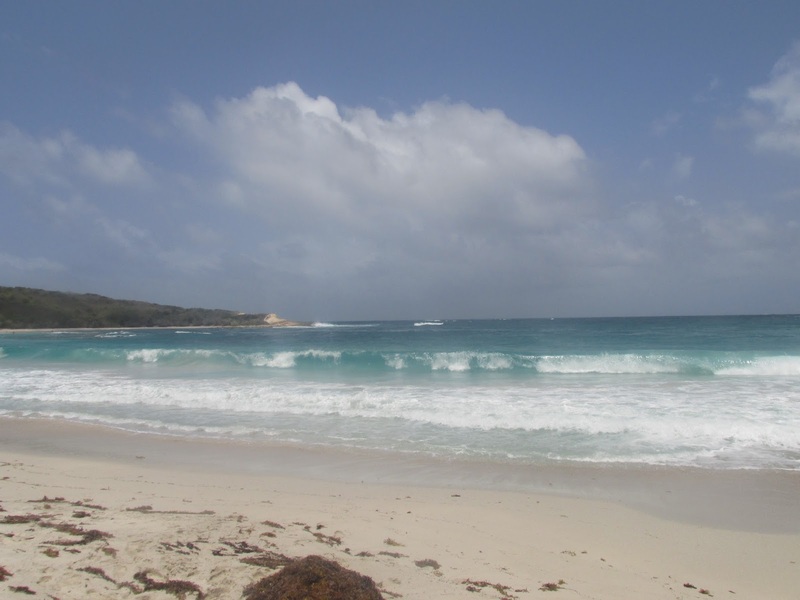 We were rewarded after the little 4×4 excursion with the most wonderful waves crashing onto unspoilt sand. It was truly magnificent and I do believe that I actually whooped with joy. Unlike some other beaches in Antigua, where there can be rubbish around, the isolated nature of this beach leaves you with a fresh taste in your mouth. The other couple on the beach had walked there. It takes about an hour and a half to walk. As a perfect day outing, hike in with a small picnic of sushi rolls from Epicurian supermarket and enjoy a swim to cool off before the hike back out again. Remember suncream though as there is very little shade here, the only trees being at the entrance to the beach. 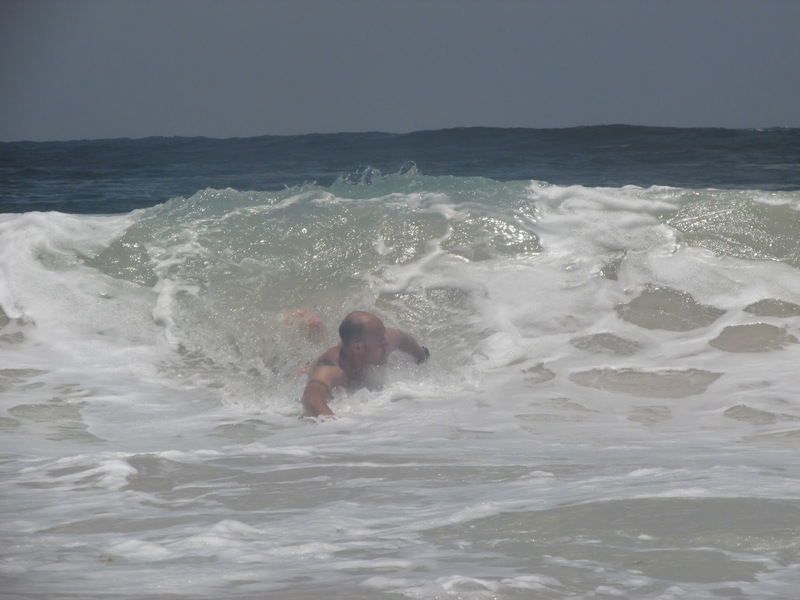 Our kids aged 6 and 4 loved this beach and the surf, so as a family I would recommend it. Rendezvous is one of the most unspoilt beaches in Antigua and it’s pristine nature combined with the great waves make it a wonderful place to seek out (with or without the rum punch). Oh and if you have any good rum punch recipes, do let me know! The rum is plentiful here.